Lace on top of lace... why not? I love the look of these two kinds of embroidered organza lace together, ultra girly yet playful. The recent trend/comeback of overalls and dungarees is going out of control but I don't mind one bit! I have always loved overalls so I am happy to see them with a modern twist such as this darling embroidered lace overalls gifted by Montar. I can't even begin to explain how much I adore this little number. Everything I've tried layering it with looks amazing! Floral print, stripes, solid color, polkadots... everything goes! 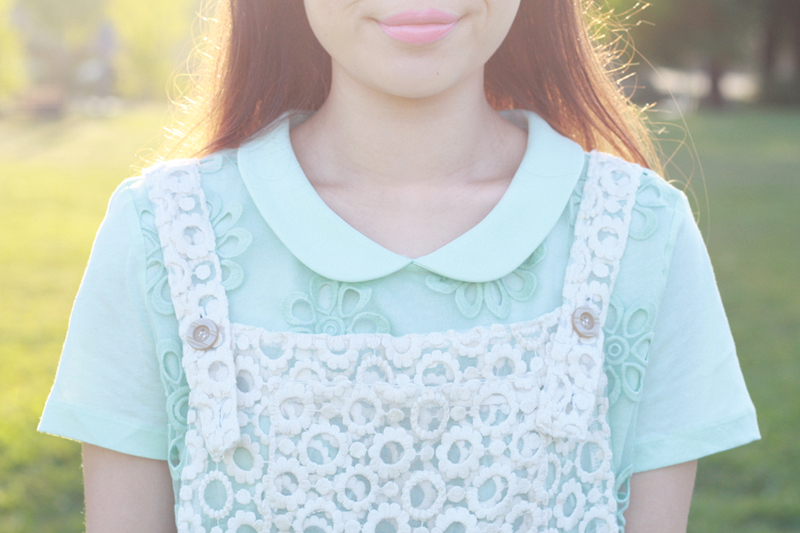 I love playing with textures so I settle with a mint peter pan collar top from H&M which is mostly cotton with an eyelet-like lace overlay on top. I complete the look by tying a vintage daisy scarf on my head and kicking it in sparkly socks and jewel-embellished Miu Miu swallow mary janes. Embroidered lace overalls c/o Montar. 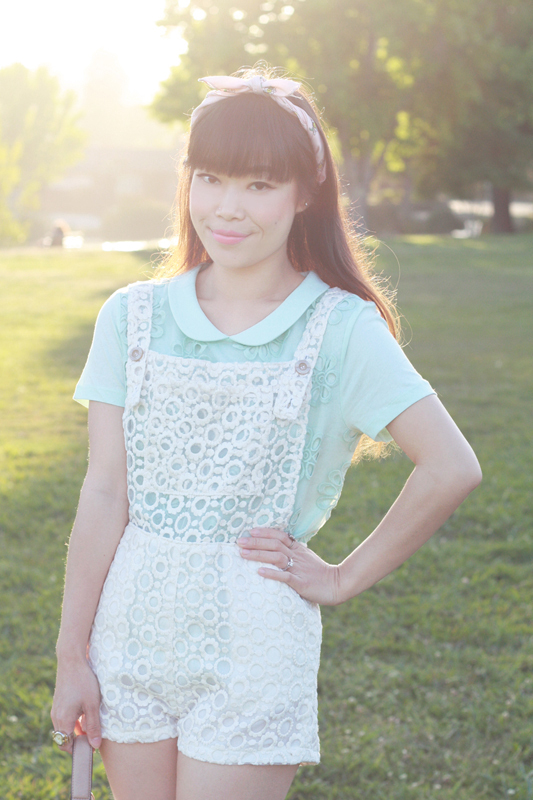 Mint peter pan collar eyelet lace top from H&M. Thrifted vintage daisy silk scarf. Miu Miu satin mary janes. It's so lovely! and I adore your shoes! Your hair looks super cute that way! And those shoes are amazing. I love Miu Miu! I love your style so much!You're so cute! 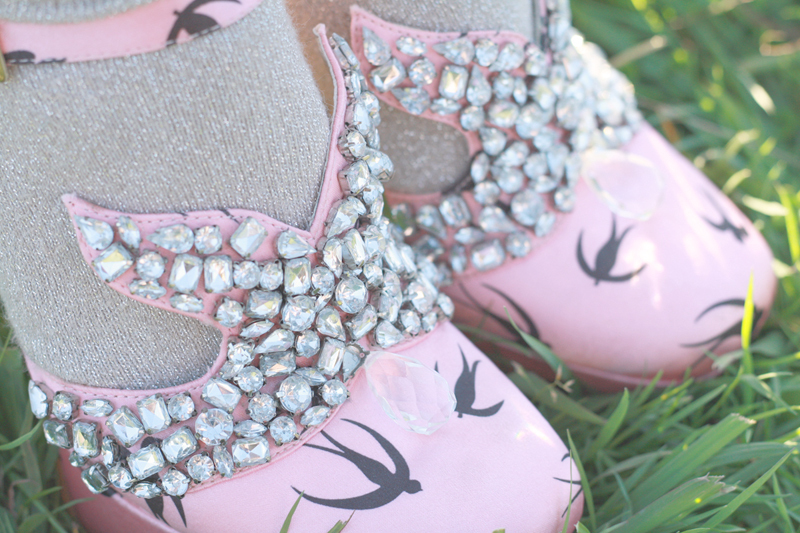 This is just so absolutely adorable and girly! I love the two lacy prints together. These overalls are the cutest I've ever seen, I think. I have been looking everywhere for those shoes!